Rosenstein Rejects Pressure From Hill, Vows Justice Dept Won't Be 'Extorted' The deputy attorney general used a Law Day appearance in Washington to defend himself and the Justice Department from a pressure campaign waged by Trump allies. Deputy Attorney General Rod Rosenstein said he and the Justice Department would not be intimidated by criticism or threats such as new "articles of impeachment." Deputy Attorney General Rod Rosenstein dismissed threats from antagonists in Congress on Thursday following months of tension between the Justice Department and conservative supporters of President Trump. Rosenstein appeared at the Newseum in Washington, D.C. to celebrate Law Day and was asked about threats from members of Congress, including the putative "articles of impeachment" about him drafted by allies of Trump. "There have been people who have been making threats privately and publicly against me for quite some time and I think they should understand by now the Department of Justice is not going to be extorted," Rosenstein said. Rosenstein said he's not sure who in Congress wrote a document that could be used to remove him from office. It appeared on Monday in The Washington Post. But Rosenstein says when the Justice Department accuses someone of wrongdoing, the process isn't arbitrary. It uses evidence and credible witnesses. 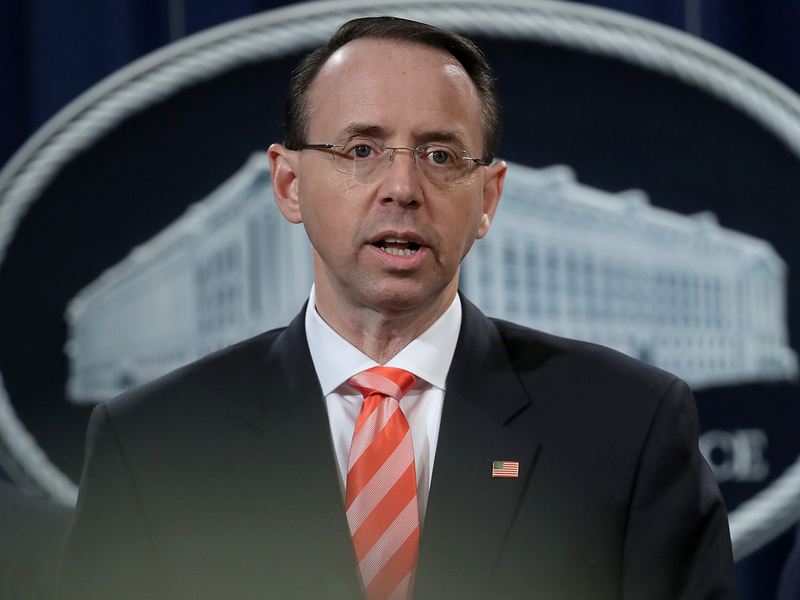 Rosenstein says the Justice Department needs to protect national security and confidential informants as well as the integrity of ongoing criminal investigations like the Russia probe. Special counsel Robert Mueller, who is running that investigation, reports to Rosenstein. Attorney General Jeff Sessions has recused himself from the Russia matter, citing the role he played as an adviser to, and surrogate for, Trump in 2016. That is why Rosenstein has become the focus of criticism for conservatives, who want to help protect Trump from what they and the president call Mueller's "witch hunt." Trump cites the clean bill of health he has received from the House intelligence committee's majority Republicans, who found no conspiracy between his campaign and Russia's attack on the 2016 election. So the ongoing Senate intelligence and Justice Department investigations must be baseless, he argues. Rosenstein, the Justice Department and the FBI also have been the subject of broader criticism as part of allegations they abused their powers out of "bias" against Trump. For example, Rosenstein followed a line of earlier Obama and one Trump-era Justice Department officials who reauthorized ongoing surveillance of a onetime former Trump campaign adviser, Carter Page. Rosenstein also approved an FBI raid last month that seized a trove of evidence from Trump's longtime attorney, Michael Cohen, as part of a months-long criminal investigation into his business practices that was taking place in New York City.